This is a continuation on our series on tips to make the writing process and your writing career more organized, less stressful, and more effective. There is a small chance that I might be a little bit competitive. My husband and I keep a cribbage board on our coffee table so we can continue our complicated, in-depth tournament whenever we have a spare half an hour. I may or may not have resorted to yelling at my sister over a game of Sorry or Apples to Apples. For me, it's just not a cozy family gathering until there are winners and losers and I am collecting my bountiful spoil. Okay, okay, so I have to plead guilty. There are a lot of ways in which being a writer and a competitive person is terrible combination. Obviously, there isn't a lot of good that can be done by stalking your critique partners' book reviews, or obsessing over the Amazon rankings of authors in your genre. However, there is still a place for healthy competition in a writer's life. For me, competition comes in three forms: against myself, against a clock, and against a situation I can't control. To compete against myself, I keep a writing journal. Before I begin the day's work, I write down what I want to accomplish, what I've been struggling with, and how I think I'll fix certain problems. At the end of the day, I write down what I actually accomplished. End-of-day Me has to report to beginning-of-day Me and be held accountable for her actions. On good days, this means I write "I wanted to write 750 words today and get to the end of the scene with the Cheetos. I got to the end of the Cheetos scene at 600 words, but I kept writing and got 1,000 words today!" I like writing that a lot more than I like writing "I got distracted watching Property Brothers and, um, I thought about my plot a lot... does that count?" When I am writing a first draft, I write best in short bursts. Give me a half an hour timer or an active sprinting hashtag on Twitter and I can churn out 1,000 words in half an hour. Just don't ask me to do it again for a while. It isn't a pace I can keep up, but slow and steady doesn't work for me during rough drafts. Fast and sporadic keeps me excited about the story, and my fast writing pace helps keep the plot moving forward as well. My last method of competition is sort of a mix of the other two and is driven out of necessity. My husband and I will agree to watch an episode of Friends after he finishes the dishes. I'll put my daughter down for her nap on a Saturday afternoon. I have a limited, but uncertain, amount of time to finish what I need to write. This sense of urgency, combined with the uncertainty of not knowing when the dishes will be done or when my daughter will wake up, keeps me on task and focused. For me, immersion in my world and characters doesn't come until I'm editing on paper. I need to get the story out before I concentrate on setting and whether my voice is consistent (confession: it probably isn't). Do you work better with no distractions for hours and complete immersion, or in short bursts, working quickly? Does it vary depending on what part of the writing process you're in? Only one more week until QueryTracker 5. One of my favorite features of the new version, and one I hope you all like as much as I do, is the Query Timeline. The Query Timeline shows all the queries sent to a selected agent in a convenient and easy to read timeline graph. This allows you to see a visual representation of the agent's replies. With this information you can determine where your query lies in the agent's queue, if the agent responds in order, or if your query was skipped. It's going to take a lot of the guess work out of the waiting game, and hopefully allow a few querying authors to get a good nights sleep -- now and then. Laurisa (@lwreyes) is this week's winner of the 5x5x5 give-a-way. Congratulations Laurisa! She has won a $100 gift card to either Amazon, Barnes and Noble, or ITunes. Her choice. There are still 3 weeks and $300 to go, so get your entries in now. My children love corny jokes, so I frequently hear elephant jokes. Things like, "How do you get an elephant in the fridge?" / "You open the door and put in the elephant." My children will also ask, "How do you eat an elephant?" and then tell me, "One bite at a time." I've talked before about the value of incremental effort for writers. If it takes a hundred thousand words to make a book, or a hundred hours to make an edit, or a hundred books read to make a good writer, then you're going to have to get used to taking small steps toward your overall goals. The important thing is to guide your steps in the right direction. And keep taking them. Michael talked about having a routine to boost writing productivity, but I'd like to take that a bit further into mapping out your goals such that you have specific, reachable goals you can hit on a daily basis, a weekly basis, a monthly basis. Back in 2013, I met my agent for lunch and griped that I'd been stalled at 35,000 words on my novel for far too long. I forget what I said, but I effectively gave myself a kick in the pants. Lent had just started, so I turned it into Personal Novel-Writing Lent. A thousand words a day, no excuses. I feel my writing is a God-given vocation, and therefore for me it fit nicely into the category of "spiritual discipline." I got a notebook and my fountain pen, and they accompanied me everywhere. I had to estimate what that thousand words was since I was hand-writing it, but 40 days of Lent should net me 40,000 words (with the occasional day off for taking a sick child to the ER.) That would put me in striking range of the ending. Nice and measurable. (I screwed up the measurements and ended up with more than 1k per day, but that's fine.) Sustainable. After that, the next goal was to have the entire hand-written portion of the book entered into the computer in two weeks. Definable. Then a nice round goal of one month to do my first- and second-pass edits. Get it off to beta readers. Incorporate their suggestions. (That part was tricky because it wasn't solely dependent on me, and you can't rope other people into your goals.) And then have it to my agent by June. Then get it on submission by September. I outlined every step and knew what it would take to achieve it, and having that goal every day kept me on target. You can't eat an elephant in one bite; similarly, a book-length manuscript is huge. You can't just spit it out. Books don't have spiecific patterns, but the same way you can say, "I need to reach the heel turn today," you can also say "I need to reach 45,000 words by the end of today," or "I need to get the first draft of my query letter written by 9pm" and eventually "I need to decide by Thursday which of these agent offers to accept." Having a goal you can hit means you will be more motivated to try. Higher motivation boosts productivity. Good luck! Characters – I always start by writing a paragraph about each primary (and sometimes secondary) character’s backstory and quirks such as, “Roberta is obsessed with grape soda and wears two pairs of underwear on road trips.” It’s also a great place for me to put a reference picture. Plus, it’s easy to give to an agent or editor as part of a proposal. Setting – Just a quick paragraph (or more if it’s SFF) to work out the rules of the environment. The best case scenario is if I can make my setting into a character itself that my MC has to wrassle with at some point. Themes – This is my absolute favorite. Identifying thematic layers can create more plot complexity. Also, defining the characters and situations that work within each theme generates all sorts of ideas for dialogue and conflict. Tormenting My Main Character – To begin with, I identify my MC’s primary objective in my plot. My acting teacher always said that overarching objectives should be simple – find love, right a wrong, protect family. Then, I have to figure out how to systematically threaten my MC’s objective in every way I can think of. I make a numbered list of the crappiest mental, physical, and situational obstacles I can throw at her to keep her from getting what she wants. Finally, I put them in order of escalating conflict. It feels kinda evil while I’m doing it, but it saves me from a saggy middle and from going easy on my MC when I shouldn’t. Knowing the subplots and transitions from one obstacle to another is something I like to discover as I go. I’m not a fan of squeezing every bit of mystery out of a story. But, I’m not interested in doing structural surgery on my story cause it lacks momentum, either. In total my mini-outline is really only a couple of pages. It tackles the fun stuff, so my pantser-self enjoys writing it, yet it has enough substance to keep my plotter-self confidently on track. It’s a huge time saver. Now, I’d like to believe that I made up this particular mini-outline, but I’m sure others have done it before me. However, I’m perfectly happy to live with the self-delusion that I’m a snowflake. Don’t forget that our QueryTracker's 5x5x5 give-a-way has begun. FIVE winners in FIVE weeks will receive a $100 prize. Bam! I remember the first time I used a real microscope. It was part of an old high school kit, with prepared slides with a three-lens magnification range, and had probably belonged to my uncle. It reminded me of horn-rimmed glasses and lettermen jackets and Richie Cunningham’s DeSoto, all sorts of ancient things that didn’t fit into the then-modern 80s. But, man, did that thing blow my mind. It even came with a box of blank slides and cover slips so you could prepare your own specimens. If something was small enough to fit under that glass, it went under. I would examine each specimen and marvel at all its tiny parts, pretending to be a scientist, feeling like a giant. The microscope wasn’t just a nifty gadget—it was an important learning tool. Not because it foreshadowed the microbiology classes I’d take in college (mmm, I can still remember the smell of the culture room. Yummy. *makes retching sound*) but because it taught me a subtle but important aspect of management: everything, no matter how big, is made up of tiny parts, and sometimes tiny parts are easier to manage than one great big part. That concept is the basis for the way I manage big tasks in every aspect of my life, from my day job to my duties as a domestic deity. There is always something that needs doing, and I will be the first to admit that I might push off the big stuff in favor of smaller things. Facing a big, complex task (like Clean the Basement) is like facing a giant on the field of battle. It reminds me of the ancient story of David and Goliath—a boy faced a giant on the field of battle, armed with only a slingshot and a handful of stones. One stone at a time, David brought that giant down. Trouble is...goliaths are scary and I’m no David. My writing life is no different. Books are big things. Completing a Novel is a goliath task when you step back and take it in as a whole. It’s nothing short of a formidable opponent. But when you zoom in on the process and look at all the separate steps that go into it—writing, editing, revising, and so on—you can see the building blocks comprising that process. Individual building blocks are manageable things. You can’t lift a brick house, but you can pick it up one loose brick at a time. And that’s how David defeated Goliath, right? One stone at a time. When I was writing my first novel, I only had one task: Write the Story. I wasn’t editing a separate book, or promoting an earlier release, or expanding a platform. My first novel was a hobby book and, spared the then-unknown distractions of marketing and promotion, I simply reveled in the experience of creating a world of characters and plots and intrigue and things with sharp teeth that hide in the shadows. All I did was Write the Story. It was one task, and a very manageable one. Now, my writing process isn’t so simple. Writing my current book has been a completely different experience. My main task is to Complete the New Novel. But that’s not the only thing on my to-do list. I have a backlist that needs constant promoting. Halfway through writing the second draft I got a little distracted and produced two ebooks (and a print book. Whoops.) I ran blog tours and promotions and sales and messed around in Photoshop to design book covers and Facebook banners and even revamped my newsletter template. When I look back at all that, I think: what a schedule! Each task on that list is a goliath in itself, with the top of the list being Complete the Novel. If you’ve never tried to deconstruct a goliath task before, I suggest you start with a list of projects you want to accomplish, then break each one down in outline form. a through z to the nth power) All the steps that go into completing it. And that’s just the manuscript part. Number two is the cover, number three is formatting, number four is marketing plan, and so on. Everything on that list is just a tiny part of what goes into the goliath sitting at the top of the list. THE PROJECT: Complete the Novel. I will complete that novel. I will get it done, line by line, part by part, one bullet point at a time. Breaking my big projects down like this keeps a project manageable, and keeps me moving forward. I complete a small task, I cross it off, and I’m ready to move on. It also lets me celebrate little victories at the time. Each time I check a line off, I accomplish something. I’m a firm believer in encouragement and praise and having a cupcake for a job well done. I think most people are, too, but my philosophy of task deconstruction means lots of cupcakes along the way instead of a ten pound cake at the very end. A goliath cake doesn’t get eaten all in one sitting, but a dozen cupcakes can be eaten, one by one, spread out over time. That's what makes the victory attainable—and so very sweet. Sarah M. (@appifanie) is the first winner in our 5x5x5 give-a-way. Congratulations Sarah! There are still 4 weeks and $400 to go, so get your entries in now. Most writers go through periods of re evaluating their “process,” especially at the start of a new year. We dutifully set deadlines, resolve to get up at 5:00 a.m. for some undisturbed writing time (well, not me, but more about that later) or impose a daily word goal. Taking a cue from the classic “It’s opposite day” game that most parents recognize, sometimes I find it helpful to deviate from all whatever technique du jour I’ve been using and do the opposite. Not making your two thousand word a day count? Try reading TV Guide and cut yourself some slack for a few days. If your approach is to meticulously outline and write each chapter in sequence, and you find yourself stuck, try writing a chapter, scene, or even a scrap of dialogue out of order. You can cut and paste it later. Better yet, come to the dark side with me and try the seat-of-your-pants approach. A caveat: What works for one project doesn’t always work for another. Your written-on-the-fly novel may have poured out of you over a long weekend, but that doesn’t mean your muse has left for greener pastures if you’re still staring at an empty page on your current novel. So try doing the opposite: Write down the “guts” of you book: scenes you know need to be included, plot developments, sub-plots, character arcs, themes, plot twists, etc on individual index cards. Line them up in order on the floor or on a bulletin board so you get a visual of where the story is going and how you get it there. The point is, if you get so fixated on following your routine, or lack thereof, you may end up with a whole lot of empty pages, or worse, a whole lot of mediocre pages. My theory is that eventually we find a process that consistently works for us and it’s different for everyone. I will never get up at 5:00 a.m. to write for the same reason I won’t get up at 5:00 a.m. to do anything: I don’t want to. The beauty of putting a story on a page is that you created it and somehow found the time and discipline to finish it despite the demands of your daily life. Readers don’t care whether you wrote it five hundred words at a time, off the top of your head, or somewhere in between. So why should you? Today’s post continues with the theme of how each member of the QT blog team keeps (or tries to keep) our writing or writing process/career organized, less stressful, and more effective. Over the years, I’ve learned to streamline my writing (more so now that I’m a published author with multiple book deals). It used to take me a year to finish writing and editing a book. With my first book (which was never published), I got a tiny bit carried away and spent TEN MONTHS planning it. At that point, I was writing YA fantasy and for some reason felt it was necessary to figure out EVERY TINY DETAIL about my story world. And that included the types of plants that would grow there based on soil type. Did I use any of this information in my novel? Nope. It wasn’t necessary to the story. Research is another area I’ve learn to rethink. My books often require some research before I can figure out my characterizations. For example, in my first published book (Tell Me When), I dealt with stalking and post traumatic stress disorder. I needed to understand how an eighteen-year-old girl would react to different situations in the book based on what she had endured prior to the story. I had to research these topics first. But while writing my books, I quickly learned that I didn’t need to stop writing every time I had a minor research question. Let me ask you a question. How many of you can go onto the internet and only look up the ONE thing you need to know? How many of you decide that since you’re already online, you might as well quickly peek at your inbox (especially when you’re querying)? How many of you end up then checking out Twitter and Facebook and all your other social media sites instead of returning to your WIP? *puts up hand* Now, I don’t stop to look up those details as I write. I make a note in my manuscript (which is easy to do because I use Scrivener), and go back to look them up once I’ve finished my first draft. And because I use Scrivener, those comments are easy to find. I don’t have to spend time combing through my manuscript to find them. Another thing I do to increase my daily output is writing sprints. I see how many words I can write in an hour and then take a brief break before continuing with the next bout of sprints. I also write first thing in the morning (5:30 am) and don’t check my inbox until I’ve written for an hour (then I have to get my kids ready for school). I also schedule my writing time so that it gets done. All of these things have helped me increase my productivity. 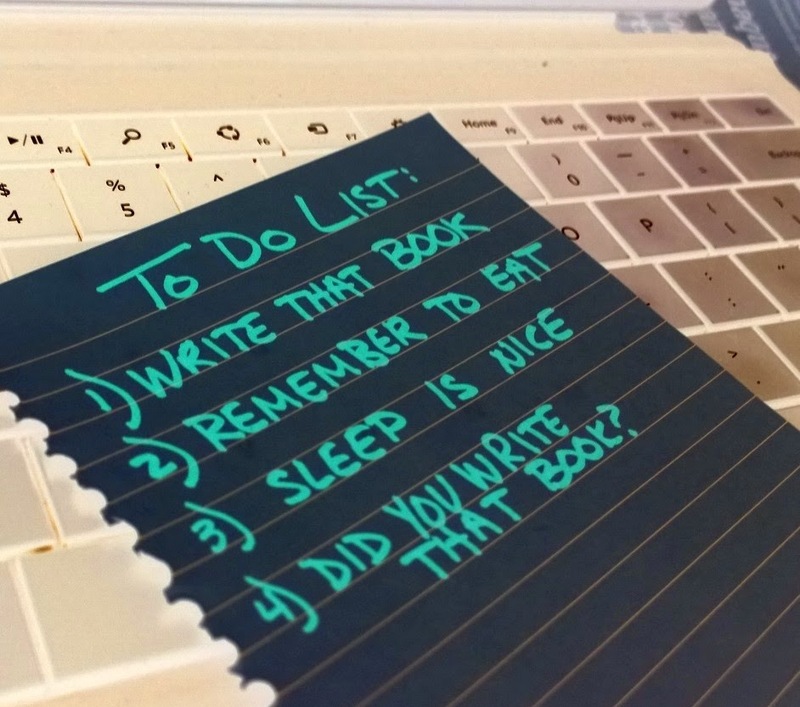 What helps you increase your writing productivity? Don’t forget that our QueryTracker's 5x5x5 give-a-way has begun. We're giving away $500 to celebrate the new QueryTracker version 5 coming soon. FIVE winners in FIVE weeks will receive their cut of the $500 prize. • Look for the Rafflecopter entry form (see below) on all our blog posts for the next FIVE weeks. • Log into Rafflecopter using your Facebook account or Email address. • Follow the instructions to tweet, post, and follow and receive entries into the raffle for every action you take. We'll randomly award a $100 gift certificate to Amazon, B&N, or Apple every Sunday for the next FIVE weeks. If you leave me in my natural habitat, I'm the type of person who will reward herself for a hard day of procrastinating by spending a few minutes on Pinterest. Or Facebook. Or watching reality TV on Hulu. On my good days, I'll reward myself for writing for five minutes by taking a twenty-five minute break. Or check Facebook every five minutes because maybe something happened! I would hazard a guess that a lot of people are this way. The problem, of course, is that nothing ever gets done with this mindset, and most of us are very very busy. What we really need to do is stay focused. Enter Google Chrome. Chrome is a browser that allows for a lot of different plugins, but I really only use one: StayFocusd. Yes, Chrome. I should. Thanks. The other setting StayFocusd has is "The Nuclear Option." This one comes with a bunch of warnings, and for good reason. You can basically turn off the entire Internet, or most of it. I use this setting often in dire situations. (I would use it less if I got myself into fewer dire situations...) My "allowed sites" are few. My email, Google Drive, and a few websites I need for work. The rest of the time, for however many hours I specify, I'm not allowed on the Internet at all. What I like best about using an extension instead of turning off the Internet is that it doesn't affect things like Spotify, which helps me focus as well, or my husband, who might have choice words with me if I turned off the Internet for the evening. Similar apps exist for Firefox, Safari, and all browsers (so you can't cheat). How about you? What helps you stay motivated when your own willpower fails? The Rafflecopter Giveaway is now open! Enter now! QueryTracker's 5x5x5 give-a-way has begun. We're giving away $500 to celebrate the new QueryTracker version 5 coming soon. FIVE winners in FIVE weeks will receive their cut of the $500 prize. Look for the Rafflecopter entry form (see below) on all our blog posts for the next FIVE weeks. Log into Rafflecopter using your Facebook account or Email address. Follow the instructions to tweet, post, and follow and receive entries into the raffle for every action you take. Almost every parent I know understands the importance of the “bedtime ritual.” The components are usually something along the lines of: bathe the child, put on pajamas, brush teeth, read a couple of stories, get a drink of water, sing a song, say no to a second glass of water, say good night, say no to the next two requests to get up and get a glass of water, the child falls asleep. When the schedule is disrupted, even if it's late and the child should be exhausted, getting the child to sleep is much harder. This month, the QueryTracker Blog Team is celebrating the upcoming release of the newest version of QueryTracker.net. Patrick Mcdonald, creator of QT, has been hard at work on improvements to the main site that will make the query process even more organized, effective and less stressful. We are excited about this fifth version of QueryTracker and are celebrating the release with multiple giveaways. Over the next five weeks, we will giveaway five hundred dollars to celebrate the fifth version of the customizable database of literary agents, QueryTracker.net! 5x5x5. I wrote three books in three different genres last year under two different names for two different publishers. I also have three teen children, one of which is on the autistic spectrum. Life is not simple. What I've discovered, though, is that nobody's life is simple, but it can be simplified. And that is an incredibly valuable tool with regard to productivity. The quote above is hanging above my computer. I've had it there for years, but never really took it to heart until recently, even though I knew it was important enough to print it out and tack it to the wall. My desire to streamline my life and make my writing time more productive forced me to make some significant changes. First of all, my husband and I sold our large house in the suburbs. My kids are all graduating or have graduated high school, and we no longer needed the hassle of the yard and commute. Now, I'm not saying my key to writing is adopting a minimalist lifestyle, but there are perks to unloading the burden of maintenance and lawn care. I have a significant chunk of time freed up by moving to a lower upkeep home. I also had an estate sale and sold off well over half of my belongings from clothes to collectibles, to antique furniture. Whew. Less dusting and cleaning... more writing. Applying this "less is more" mentality to my life has left me happier, more relaxed, and more productive. For me, a messy desk was not the sign of an organized mind, it was the sign that I needed to make better use of my time and space. Other people might thrive on chaos, but for me, organization, both physical and mental (Yep, I'm a full-outline plotter), is the key to productivity. I try to purge myself of all my self-imposed chaos, both physical and in my writing rituals that make starting the day's work difficult. Now, (for the most part) I can write anytime, anywhere, on any device with a keyboard. I start my books with a clean desk in a clean office on a clean page. How about you guys? Anyone else out there freed up by simplifying? Remember to stay tuned for the 5x5x5 giveaway! New Site. New Blog. New Contest. 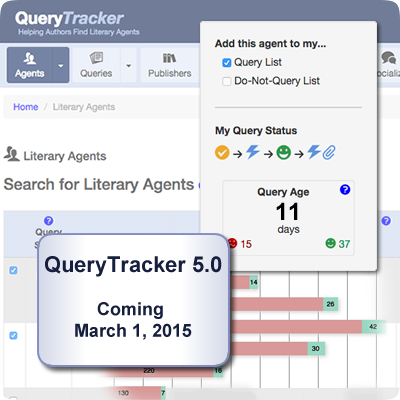 After an entire year in production, QueryTracker version 5.0 is almost ready to release. There have been a few sneak peeks of the new site already (here and here) and we’ll be presenting a full tour in the very near future. Along with the main site update, we’ve also totally redesigned the blog, including the addition of some great new blog authors. Meet the team. We are also tightening the blog's focus. Where in the past the blog discussed all things related to writing and publishing, we are now going to concentrate on subjects of interest to authors seeking representation. So, if you’re looking for an agent, you’ll want to stay tuned. To celebrate both the new blog and QueryTracker 5.0, we’re launching a 5 week contest with a total of $500 in prizes for 5 lucky winners. See the pattern? We’ll start accepting entries for the contest on February 9th, and we’ll give away a $100 gift card every Monday after that, for 5 weeks. Full details will be posted here on February 4th, so check back then or follow our blog using the form on the right, to make sure you don’t miss it.